Spring has sprung, which means families across San Antonio are making the annual pilgrimage out of the city on the hunt for the perfect bluebonnet field for this year’s family photos. While that happens, there is another subset of the city’s population that all groan in unison and vow to avoid leaving the house. That’s right, the season for heightened seasonal allergies is upon us, and it’s hitting hard. If you own or manage a business, now is the time to take action for the sake of your employees and clients alike! If you want your business to look respectable, and we know you all do, you undoubtedly clean your flooring on a regular basis. 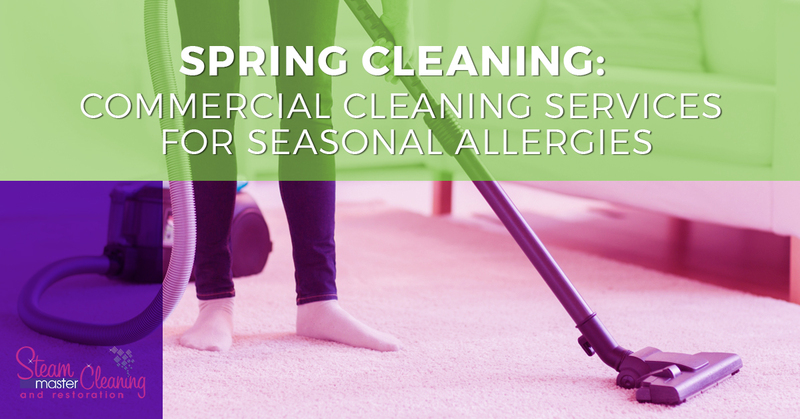 But with seasonal allergies kicking up, it’s time for a deeper clean, and your flooring is a perfect place to start. Flooring, especially carpeting, is a major collection point for allergens that come in on people’s clothing and shoes. The fibers of your carpeting grab on to all those sneeze-inducing allergens (and other bits of dirt or debris) and hold on tight. A standard vacuum can get some of that debris, but most vacuums lack the strong suction and sturdy brushes to get everything, especially any debris that gets ground into the fibers by heavy foot traffic. In order to get all that gunk out, professional carpet cleaning services are a must. The difference between vacuuming and professional carpet cleaning services is a major one. With vacuuming, the brushes loosen any debris or allergens along the surface of the fibers. However, the heavy foot traffic in any business tends to grind grime deeper into the fibers and vacuuming isn’t enough to get those ground-in bits of grime. Commercial carpet cleaning services, on the other hand, use specialized cleaners that break up allergens, dirt, and other debris deep into the carpet fibers so they can all be cleaned away. This is doubly valuable since debris can actually wear away and ruin your carpeting more quickly. Tile, stone, and vinyl flooring pose less of a cleaning challenge than carpeting, but these smooth flooring styles also need regular professional cleaning to keep them in great condition. At Steam Master Cleaning and Restoration, we have the tools and professional cleaning solutions to banish unwanted allergens and keep floors looking like new across the San Antonio metro area. While your focus is on a deep spring cleaning and getting rid of unwanted allergens, there are two other areas that need major focus: your air ducts and any upholstery around the building. As you likely imagine, fabric upholstery is a lot like carpeting in how tenaciously the fabric’s fibers grip allergens. Bonus: our upholstery cleaning services can help get rid of those unsightly drink stains as well as allergens. Let us bring our professional upholstery cleaning services to you to take care of one of the most often overlooked but vital areas of spring cleaning for businesses. The air ducts throughout your building are a major opponent in the battle against airborne allergens. Think of them as the lungs of your building. Now, imagine what happens to those ‘lungs’ when they get crammed full of pollen, dust, dander, and other debris. If you’ve seen an uptick in coughing, sneezing, or illness spread amongst your employees, your HVAC system may be at fault. Springtime is a major time for airborne debris to collect more heavily in air ducts, so now is the perfect time to get them professionally cleaned. Help your customers and employees breathe easier this spring. Contact Steam Master Cleaning and Restoration for more information on our commercial carpet cleaning services and other allergen-combating cleaning options!